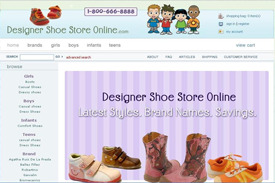 This site enables customers to shop for the latest styles in children’s shoes online from the comfort of their homes. The Ecommerce website designed by Bitochon allows customers to browse and shop at their convenience and make purchases by using a credit card. Our website design also features an administrative front-end so that our client can manage all aspects of the site, to include maintaining products, processing orders and more.